American Corporate Partners (ACP) is a national non-profit dedicated to helping our returning veterans build meaningful careers. Working with volunteers nationwide, ACP offers veterans tools for long-term career development through mentoring, career counseling and networking opportunities. ACP was founded in 2008 by Sidney Goodfriend, a former investment banker who credits much of his success to mentors throughout his career. With the start of ACP's Veteran Mentoring Program in 2008, ACP began offering one-on-one career mentorships to transitioning veterans. ACP’s Veteran Mentoring Program has since connected more than 13,000 veterans with volunteer mentors from companies nationwide. On Veterans Day 2011, ACP launched ACP AdvisorNet to assist even more veterans, and bring them together with the growing number of Americans who want to assist our returning military. With more than one million service members returning home from service and seeking new careers, the need for career guidance has never been greater. ACP AdvisorNet offers a simple solution- real advice from a diverse group of career professionals. ACP AdvisorNet gives veterans the opportunity to find experienced career coaches who are ready to help them develop their next career. Veterans can ask questions related to their professional development through the Q&A feature and receive advice from industry experts across the country. 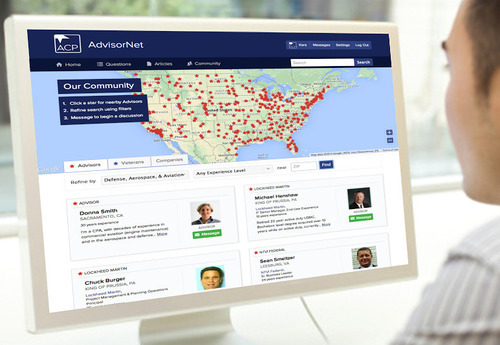 Through ACP AdvisorNet's Community section, Veterans can reach out to Advisors based on location, industry or level of experience to connect for one-on-one career coaching. Veterans can also use the site in their job search, by browsing the Jobs page to find their next career. Advisors have a unique opportunity to engage directly with the veteran community and volunteer their time and talent in a meaningful way. Advisors can answer career questions and provide advice to veterans around the country in various stages of the transition. Advisors can also write in-depth articles about topics of interest, post jobs for free and form mentoring relationships with multiple transitioning veterans. 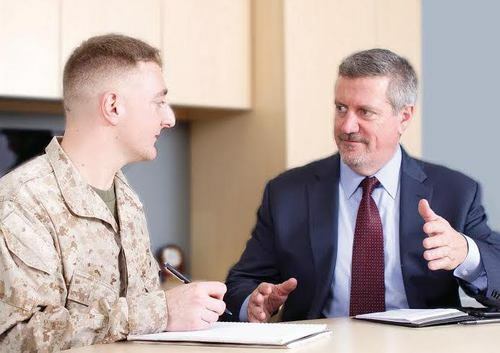 ACP's one-on-one Veteran Mentoring Program pairs transitioning veterans with employees from over 65 different companies for yearlong, personalized mentorships focused on the veteran’s individual career goals. Mentorships focus on many different areas including job search strategies, resume and interview skills, long-term career planning and work-life balance. If you are a post-9/11 veteran interested in personalized career coaching from one of our mentors, please visit www.acp-usa.org/mentoring-program/veteran-application. ACP staff is based out of New York City. We’re here to support the community of veterans and volunteers that participate in our programs. Each public post on ACP AdvisorNet is reviewed by our staff to ensure that the community stays focused on assisting veterans in their careers. If you have any questions regarding how to best use the site, or if you would like to get more involved please contact info@acp-advisornet.org to get in touch with us.